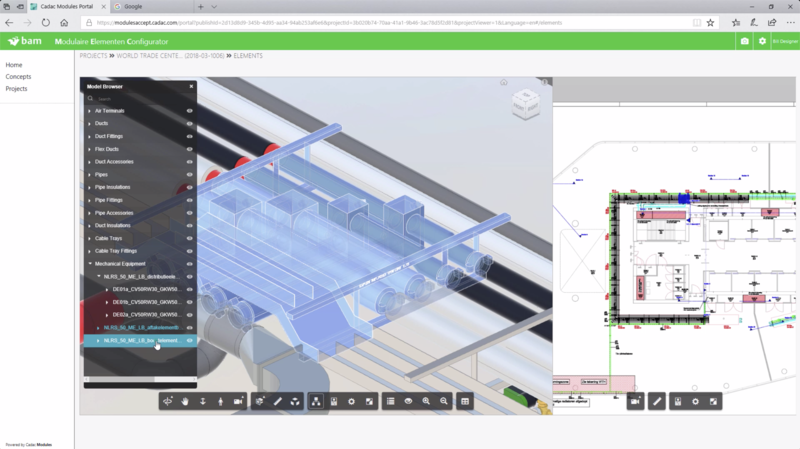 Cadac Group, a Netherlands-based Autodesk Platinum Reseller, teamed up with Royal BAM Group, one of Europe’s largest general contractors, to bring relief to construction companies struggling with tightening deadlines and project budgets. Together they developed a modular cloud-based platform to support and streamline modular engineering and construction workflows. Their solution, Cadac Modules/BAM MEC, uses Forge to take disparate construction processes and combine them into a single cloud-based solution. This cloud-based solution provides customers with a single point of access to all of their data and 2D/3D model viewing online, which in turn enables streamlined project management and flexible workflows. Increasingly, building owners are demanding buildings that are more flexible, more sustainable, and built in less time for less money. To add to these challenges, many construction industry stakeholders are already struggling to meet deadlines and generating penalties, leaving little to no financial margin if at all. This is often caused by a lack of coordination between all of the complex processes belonging to multiple stakeholders in a construction project, including BIM coordination, information management, production and on-site coordination, and sluggish owner/operator handover. How Cadac solved it with Forge. To consolidate the processes inherent in the industry struggles, Cadac and BAM used the Forge platform to develop Cadac Modules/BAM MEC. With the four modules (Project, Configure, Lifecycle, and Track & Trace) of this modular cloud-solution platform, customers can manage projects across disciplines with one single cloud-based solution. Cadac Modules empowers customers to create and manage projects and project members. It also lets them publish over 60 CAD file formats, use the Forge Viewer to view them in 2D or 3D directly in a browser, and link documents from the BIM 360 platform or MS SharePoint to individual 3D elements in the model. Stakeholders can use Modules Configure to configure 3D CAD elements in an online configurator—with real-time feedback—and then load the configurations into Revit or Inventor design software. The Forge Model Derivative in Modules Lifecycle delivers database information that team members can view with Forge Viewer technology, and then manage, validate, and secure element status, as well as change workflows. These are all supported by QA/QC and safety checklists for full BIM Level 3 support. Modules Track & Trace lets users instantly scan for, find, and view a 3D element, and complete element-specific QA/QC and safety checklists. "Forge provides us with innovative, scalable, and future-proof platform technology that enables us to help address our customers’ requirements and adds additional value to our ‘Enabling Digital’ vision." ORDERFOX.com helps members find the right production partners more efficiently by adding Forge 3D viewing capabilities to its platform.